THESE DISCS ARE CURRENTLY ON PROMOTION!! These CD-R discs have a Silver inkjet surface. We have been selling Ritek CD media for over 10 years and use it for all of our internal testing and duplication purposes. We find it has the lowest failure rate and the highest compatibility of all media available at a similar price. The result of using the Ritek Inkjet Printable CD-R with Primera, Microboards, Epson, Rimage and StorDigital Printers and Duplicators are outstanding and you will be astonished by the outcome of the burn and print quality. 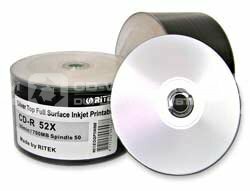 Authentic Ritek discs are a low-cost duplication solution which are perfect for home, business and professional purposes and fantastic value for your money. Our workshops and duplication facility plays host to every known manufacturer and model of disc printer and we use Ritek discs as a bench mark disc to ensure the correct operation of the printer mechanics and the print quality. Ritek . Full . Surface . Silver . Inkjet . Printable . CDR . 80 . mins . 52X . A-Grade . Pack . of . 100 .